Koch Extraction Technologies, Inc.tal column options are available for testing on site, including the Extraction Screening Unit (ESU), which consists of a 3-in. diameter x 12-18 stage, Scheibel Column with a glass shell and air drive motor. 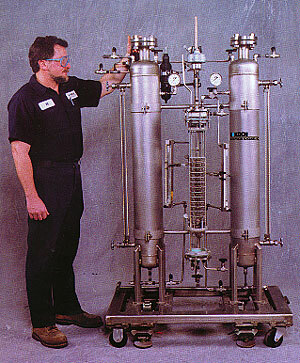 Two stainless steel tanks with sight glasses and rotometers for flow control are mounted with the column onto a portable frame. The entire unit can be operated with either air or nitrogen pressure. For flexibility, RDC internals or SMVP packing can be substituted for the Scheibel Column on the unit. In addition, the company has stainless steel Karr, Scheibel and SMVP Columns available on a rental basis. These columns are rated for 60 psig and include sight flow indicators in both ends of the columns. Koch Process Technologies, Inc., 1055 Parsippany Blvd., Parsippany, NJ 07054. Tel: 973-299-9350; Fax: 973-331-9709.